Are You Looking to Build Up Balance, Tone Your Core, or Aid Recovery After an Injury? Workout with RitFit Balance Ball Trainer to Improve Your Coordination, Body Awareness, Muscle Strength and Flexibility Tremendously! RitFit Balance Trainer is here to boost your regular workout routine in ways that you can't even imagine.Whether a casual exerciser, runner, dancer, martial artist, or any type of athlete, using our Balance Ball Trainer will work wonders for you! Superior Material&Unique Design:Constructed of durable rubber and sturdy, ABS plastic which is anti-slip.The trainer dome side up provides an ever-changing, unstable, dynamic surface while the device itself remains stable.Environmental-friendly PVC material brings non-toxic, chemical-free using experiences. Preeminent Safety Performance: Large weight capacity(660lbs)&ABS base for safety and heavy-duty structure. Strengthens, trims and tones while improving balance and coordination. Lightweight&Portable:This is the absolute best exercise gear for your home workout and a great addition to your yoga practice, which can combine physical and mental focus effectively. 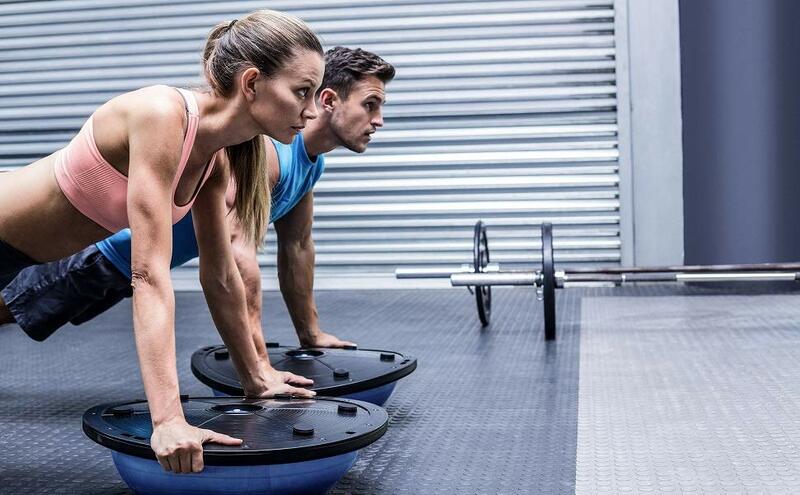 Versatile: Balance ball trainer for strengthening and coordinating core muscles. Can be used for strengthen and tone upper body, lower body, and core muscles. Ideal for rehab, after surgery work, and elders fall prevention training. 30‘’resistance bands with soft foam handle can even help kids to improve their balance, abdominal strength and overall fitness. Also help broadening workout types, so you can do front squat, standing adductor, bent-over row and more to reshape your body. Equipped with 2 detachable resistance bands, this balance ball allows users to do arms exercises, shoulder exercises, chest exercises, full-body resistance band workout, back exercises and lower-body exercises, which helps users to boost core strength, extension, coordination and burn more calories just at home. RitFit PVC exercise ball with anti-skid texture is compatible with a variety of exercises including lower-ab crunch, plank, triceps dip and more, ideal for users of all ages to increase core strength, stability and flexibility and making the best of your home fitness routine. 6 anti-slide feet together with unique anti-skid texture always keep this balance ball in place. Thus, you can play with it anywhere you like, such as backyard, beach, balcony, and more; you can also have fun with this balance ball even on smooth floor without any sliding, better defending your safety. Now Let RitFit Be Your Personal Trainer and Enjoy Superb Gym Experiences at Home!